The words management and leadership both describe ways of dealing with people, but they underscore two very different ideals. At a high level, management deals with complexity by breaking up work. Leadership deals with change by applying a vision to everyone’s work. A higher level of leadership would normally be found in the executive ranks of organizations. A higher level of management is usually found in the middle ranks of an organization. Finding the best mix of management and leadership for a person is extremely important. One reason for this is that the amount of supervision needed theoretically changes as you look higher towards C-suite positions. When less supervision is needed, there exists in subordinates attributes needed to make decisions. They need to be led more than they need to be managed. Peter Drucker said “There is nothing more wasteful than becoming highly efficient at doing the wrong thing”. I would add that “There is nothing more frustrating than knowing you are on the right path, but getting nowhere”. Management is doing a thing right. Leadership is doing the right thing. This approach is simply to focus on both project goals as well as team relationships. 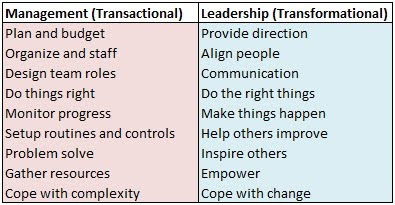 Finding the right balance of these two items determines the effectiveness of the leader. This approach can be seen in many aspects of the situational approach. This approach to leadership says that universal leadership traits and behaviors don’t exist and you must look at the situation before deciding what to do. Three popular situational models include the Vroom model, Fiedler analysis, and the Hersey/Blanchard theory. 1 - The Vroom model looks at situational attributes such as decision significance and where subjet matter experts are, assigning each one a status of high or low. A funnel method is then used to narrow down how the decision should be made (on a spectrum of autocratic to democratic). If more than one option seems to fit, use the one that will take the least amount of time. Is the leader to other relationship good? Does the leader have power? 3 - The Hersey/Blanchard theory looks at the maturity of individuals involved and decides whether to focus on project goals or personal relationship maintenance. It simply states that if a person or group has a low or high maturity, a focus should be placed on project goals. If, however, the person or group is of moderate maturity, a decision should focus on personal relationship maintenance. With knowledge workers, helping everyone to exemplify a shared leadership is critical. It is often difficult to do everything by oneself. After all is said and done, I think one of the easiest ways to act is based on a statement I once heard “Help others fall into the pit of success”. Although oversimplified, this very well may sum up the way managers and leaders should act.